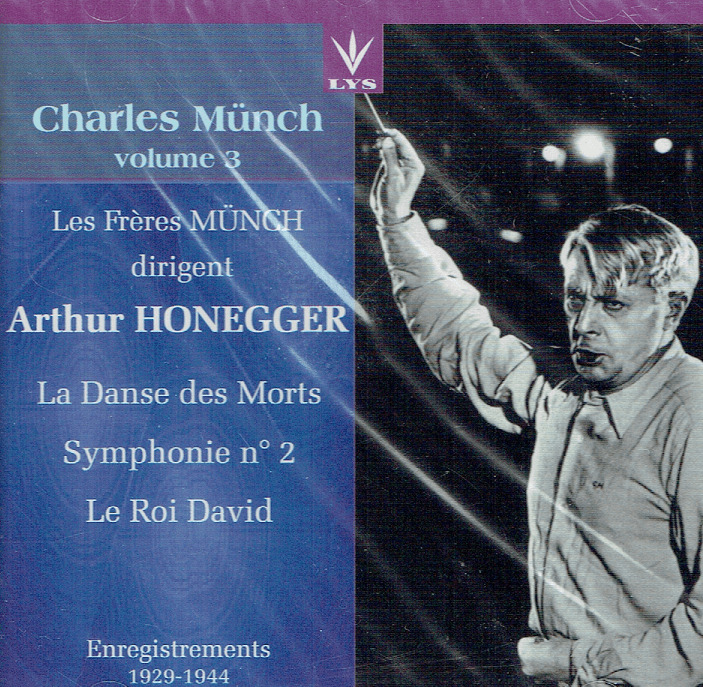 “These recordings of Honegger’s LA DANSE DES MORTS and the Second Symphony for strings and trumpet were essential recording premieres when they came out in France during the war or right after and, in the case of LA DANSE DES MORTS, it remained so for years after. Honegger was in those days at the apex of his fame and, although a Swiss citizen, viewed as one of the greatest French living composers, and although his Swiss citizenship would have enabled him to spend the occupation snugly sheltered in Switzerland, he chose to remain in France and share the hardships of the occupied French. Munch was then also an indisputable champion of the composer and he had total legitimacy in that repertoire. The recordings were made shortly after works’ respective premieres: both were commissioned and first-performed in Switzerland by Paul Sacher. And they were great versions too, although Munch later bettered himself in his subsequent studio recordings of the Symphony with the Boston Symphony Orchestra in 1953. 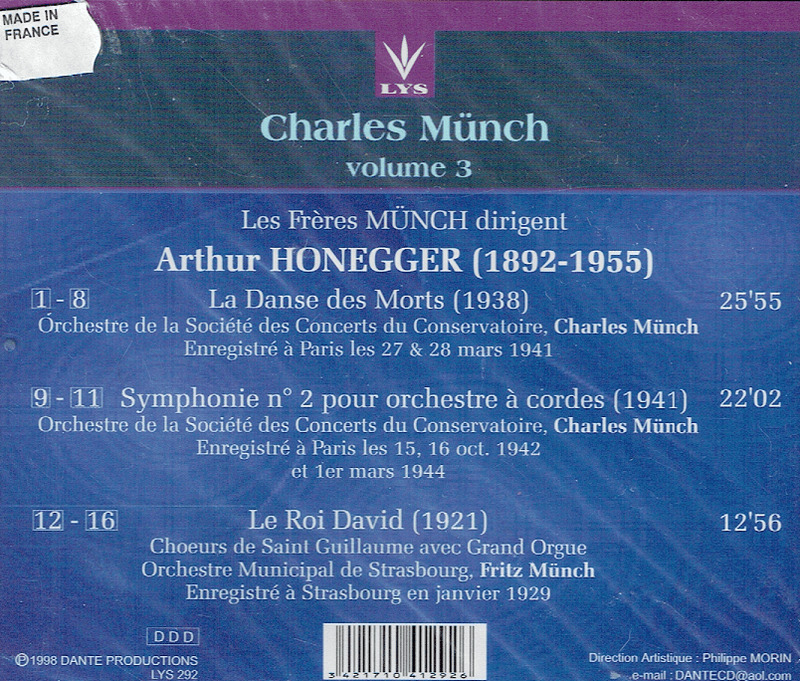 So it is really LA DANSE DES MORTS that is the main reason for the Honegger afficionado to acquire these recordings. It is a hugely powerful work and the recording benefits from the total commitment of all those involved, the nobility of tone of Charles Panzéra, the vocal beauty of soprano Odetta Turba-Rabier, but above all from speaker Jean-Louis Barrault’s halucinated delivery, unapproached in any of the recordings made after. After Dante (released in 1998), the Swiss label Cascavelle reissued the same pairing in 2005 on Vel 3060, ‘La France résistante’, although complemented not with the excerpts from KING DAVID conducted by Charles’ brother Fritz Munch, but with André Jolivet’s LES TROIS COMPLAINTES DU SOLDAT with Pierre Bernac. 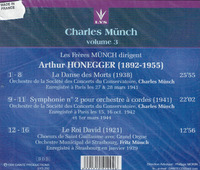 But the main difference is the filler, an all-Honegger program on Dante with 12 minutes of excerpts from the third part of LE ROI DAVID conducted by Fritz Munch in 1929, an all-Charles Munch program on Cascavelle with André Jolivet’s Trois Complaintes du Soldat sung by Pierre Bernac under Munch in 1943-44, an endearing cycle written on texts of the composer himself, after the defeat of France to Germany and the collapse of the French army, and a return of the Varèse-trained and Bartok-admiring modernist composer to a more accessible style, harking back to the vocal music of Ravel and Honegger. Dante has informative liner notes by Philippe Morin." "Ernest Frédéric [Fritz] Münch was sent to Paris for a year to improve his French (the home language was Alsatian, but German was used at school and French with his mother), and he began his studies at the Strasbourg Conservatory. Münch then joined the faculty of the Strasbourg Conservatory as a professor of music history, and eventually succeeded his father as the school's director in 1929, in which post he continued until he retired in 1960. As director he introduced classes in orchestral and choral conducting which he himself ran, and among his other teaching innovations were introducing tuition in saxophone and the use of the gramophone in classes. With the intent of ensuring that students were good teachers as well as performers he also created a course in musical pedagogy in 1934. One of his notable students was Ernest Bour. He succeeded his father as the conductor of the lauded Choeur Saint-Guillaume at Saint William's Church, Strasbourg in 1924. He ended his career with the choir in 1962 with the St Matthew Passion in Strasbourg and Les Cris du Monde and the Symphonie Liturgique by Honegger at the Festival of Zurich."